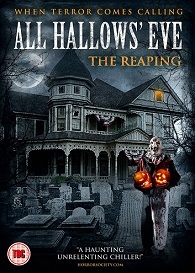 All Hallows' Eve - The Reaping is released on DVD on October 24th And to celebrate we have a great competition for you and 3 copies on DVD to give away. US horror anthology sequel. On Halloween night, a woman (Andrea Monier) receives an old VHS tape that a killer is using to find his next victim. Unaware of the gruesome fate that awaits her, the woman watches the eight short tales of horror contained on the tape. The characters featured in the stories include a group of trick or treating children, a boy struggling with night terrors, a man whose girlfriend has committed suicide and a young woman whose friend has been murdered. But what will happen when the tales are over?